Guy W ECDUE Assessment Manual for Psychopharmacology, Revised. Rockville, Md US Dept of Health, Education, and Welfare1976;Publication ADM 76-338. Background Studies show that selective serotonin reuptake inhibitors are effective for severe premenstrual syndrome and premenstrual dysphoric disorder. This study compares the efficacy of a selective serotonin reuptake inhibitor with that of a tricyclic antidepressant to determine whether efficacy for premenstrual syndrome/premenstrual dysphoric disorder is a general or more serotonergic effect of antidepressants. Methods After 3 screening months, 189 subjects were randomized to sertraline hydrochloride, desipramine hydrochloride, or placebo for 3 months of double-blind treatment. The flexible dosage range was 50 to 150 mg/d. The outcome measures included the Penn Daily Symptom Report (DSR), the Hamilton Depression Rating Scale, the Clinical Global Impressions–Severity Scale, the Quality of Life Scale, and Patient Global Ratings of Functioning and Improvement. Analyses included all subjects with treatment data, with the last observation carried forward. Results Sertraline was significantly more effective than placebo or desipramine; desipramine was not better than placebo (F2,163=12.47, P<.001). All DSR factors were more improved with sertraline compared with desipramine and placebo; the factors for mood (P<.001) and pain (P=.05) were significant, and the results of all outcome measures were consistent. A history of depression, postmenstrual symptom levels, and other diagnostic variables added individually as covariates did not alter the treatment results. At end point analysis, DSR symptoms had decreased by more than 50% in 40 subjects (65%) in the sertraline group, 18 subjects (36%) in the desipramine group, and 16 subjects (29%) in the placebo group (P<.001). Conclusions The comparison of 2 classes of antidepressants strongly favored the serotonergic drug, which effectively reduced symptoms and improved functioning and was well tolerated by women with severe premenstrual syndrome. A history of depression did not alter the treatment results. The purpose of this study was to determine whether antidepressant efficacy in PMS treatment is specifically serotonergic or a more general antidepressant effect by comparing 2 classes of antidepressant drugs. The primary hypothesis was that a serotonergic antidepressant would be superior to a more noradrenergic tricyclic antidepressant for PMS symptoms overall, while the noradrenergic antidepressant would be more effective than the placebo for depressive symptoms. A second aim was to determine whether antidepressants relieve PMS symptoms independent of a history of major depression or a subclinical level of symptoms postmenstrually, both of which might indicate an underlying depressive illness as the possible reason for response to antidepressant medications. The study was conducted in the Premenstrual Syndrome Program at the University of Pennsylvania Medical Center, Philadelphia. Women who requested PMS treatment were mailed a Penn Daily Symptom Report (DSR) with instructions for daily rating. After completing the DSR daily for 1 menstrual cycle and undergoing a brief telephone screening, potential subjects made the first screening visit postmenstrually (cycle days 6-12) (n=520). At this visit, the DSR was reviewed, and the Structured Clinical Interview for DSM-IV Axis 1 Disorders–Patient Edition (SCID)22 and a 25-item Hamilton Depression Rating Scale23 (Ham-D25) were administered. Subjects were given a urine test kit with instructions for performing the at-home test to indicate probable ovulation. At screening visit 2 (scheduled in the premenstrual week of the same cycle), the Ham-D25 was administered to assess the premenstrual period; medical history and the supplemental baseline symptom evaluations (listed below) were obtained; and laboratory screening (complete blood cell count and blood chemistry panel) and physical and pelvic examinations were conducted. Subjects who remained eligible (n=278) were given placebo capsules (single-blind) to take daily throughout the third screening cycle. Subjects who continued to meet the eligibility criteria (n=189) were then randomized to double-blind treatment. Reasons for discontinuation prior to randomization were failure to meet entrance criteria (n=86), withdrew consent (n=75), lost to follow-up (n=74), current psychiatric illness (n=38), other medical problems (n=24), placebo response (n=20), adverse events (n=12), and insufficient response (n=2). The study was approved by the Institutional Review Board of the university, and written informed consent was obtained from the subjects. Inclusion criteria were age 18 to 45 years; regular menstrual cycles of 22 to 35 days (documented in the DSRs throughout the study); evidence of ovulation as tested in the screening period; experience of distressing premenstrual symptoms for at least 6 months; report of moderate to severe impairment in work, family life, or social activity on subject global ratings; meeting the stated PMS criteria on DSR ratings; general good health; and no major psychiatric (DSM-IV) diagnosis within the past year. Study exclusions included use of psychotropic medications that could not be discontinued for the duration of the study; all other prescription and nonprescription treatments for PMS; pregnancy, breastfeeding; hysterectomy; symptomatic endometriosis; irregular menstrual cycles; not using medically approved contraception; serious health problems; any major Axis 1 psychiatric diagnosis, including major depression currently or within the past year as assessed by the SCID22; risk of suicide; and alcohol or drug abuse within the past year. The PMS assessment was based on the previously validated DSR,24 SCID interview, and Patient Global Ratings of Functioning and Improvement. The DSR lists 17 common PMS symptoms, including the 11 symptoms of the research criteria for premenstrual dysphoric disorder (PMDD) in the DSM-IV: depression, feeling hopeless or guilty, anxiety/tension, mood swings, irritability/persistent anger, decreased interest, concentration difficulties, fatigue, food cravings/increased appetite, insomnia/hypersomnia, feeling out of control/overwhelmed, poor coordination, headache, aches, swelling/bloating/weight gain, cramps, and breast tenderness. Subjects rated each symptom daily on a 5-point scale (0, none to 4, extreme; descriptors were provided for each point). Scores were calculated by adding the ratings of cycle days 5 through 10 for the postmenstrual scores (day 1 was the first day of menses) and the ratings of the 6 days before menses for the premenstrual scores. The DSR criteria were a total premenstrual DSR score of 80 or greater and an increase of 50% or more from the postmenstrual score for the placebo-treated screening cycle and for the mean of the 3 screening cycles. In addition to meeting the stated PMS criteria required for the study, 74% of the sample also met the DSM-IV diagnostic criteria for PMDD (ie, ≥5 PMDD symptoms rated absent or minimal postmenstrually and severe premenstrually, with at least a 50% premenstrual increase for each of the 5 qualifying symptoms and confirmation in prospective DSR ratings). The main reason that subjects did not meet the PMDD criteria was not having 5 of the specific PMDD symptoms that met the premenstrual severity criteria (on average, the subjects without PMDD had 3 of the specified PMDD symptoms that met the severity criteria). This was a randomized, double-blind, parallel-design treatment trial comparing sertraline (an SSRI), desipramine (a predominantly noradrenergic tricyclic antidepressant), and placebo. A 3-month treatment period was preceded by a 3-month screening period. Sample size requirements were determined from analysis of DSR data in a previous trial25 and indicated that 180 randomized subjects with a 20% dropout rate were required to provide 90% power to detect differences of 44 DSR points among the treatment groups. Randomization was generated from random-number tables, and treatment assignment was conducted at the outset of the study by a technician with no clinical contact. Medication was prepared by the pharmacy in identical capsules for double-blind administration. At each visit, subjects returned all unused medication, which was counted by the study coordinator, and medication for the next cycle was dispensed. Treatment evaluation visits were monthly at cycle day 1 ± 3 to assess the premenstrual symptoms. The DSRs continued throughout the study and were collected and reviewed at each office visit. Following the study, the subjects could be treated at the discretion of the study physicians or return to their own physicians; the latter choice was typically made by those who traveled long distances to the study site. The dosage range of sertraline hydrochloride or desipramine hydrochloride was 50 to 150 mg/d, based on a pilot study of patients with PMS that indicated that this dosage range reduced PMS symptoms.26 Medication was administered once each evening throughout treatment according to a flexible schedule. The initial daily dose of 50 mg of sertraline hydrochloride, desipramine hydrochloride, or 1 placebo capsule started on day 1 of the menstrual cycle. In the absence of clear improvement, the dosage was increased to 2 capsules per day (100 mg) at the beginning of the second menstrual cycle and to 3 capsules per day (150 mg) at the beginning of the third menstrual cycle unless precluded by side effects. The mean (SD) dosage levels in the third treatment cycle were 105 (37) mg/d for sertraline hydrochloride, 115 (40) mg/d for desipramine hydrochloride, and 2.6 capsules per day for placebo (a dose equivalent to 130 mg). The primary outcome measures were the premenstrual DSR scores (added for the 6 days before menses) and the Ham-D25 scores, rated for the preceding premenstrual days at each visit. The total DSR score, 5 factors, and the 17 individual DSR items were examined. The statistically derived factors included mood (irritability/anger, mood swings, anxiety/tension, depression, feeling out of control, feeling worthless/guilty, or decreased interest; behavior (poor coordination, insomnia, difficulty concentrating/confusion, or fatigue); pain (aches, headache, or cramps); physical (breast tenderness or swelling/bloating); and food cravings/increased appetite (a single item in the factor analysis). The Ham-D25, which included additional items on sleep and appetite, was used; scores were obtained for both the 25 items and the basic 17 items. The subjects were rated for the postmenstrual week at visit 1 and thereafter for the most recent premenstrual week. Additional outcome measures included the Clinical Global Impressions (CGI) Scale Severity subscale (CGI-Severity),27 a clinician rating of symptom severity on a 7-point scale ranging from no symptoms (1) to extreme severity (7), and subject Global Ratings of Functioning and Improvement, rated on a 5-point scale with descriptors for each point, ranging from none (0) to complete (4). Patients rated functioning in work, family life, and social activity on 5-point scales, with descriptors (0, no disruption, to 4, severe disruption). Scores were obtained for each of these dimensions of functioning. Subjects also rated the Quality of Life Scale (QOLS),28 a self-report measure of various aspects of daily living plus a global assessment of overall life satisfaction during the past week. The 14 QOLS items are the summary scales of the Quality of Life Enjoyment and Satisfaction Questionnaire, which has been shown to be a reliable and valid measure of quality of life and detects medical treatment effects in mood disorders.29,30 Subjects rated each item from very poor (1) to very good (5); the item ratings were added for a total score, with higher scores indicating a better quality of life. Of the 189 subjects who were randomized to treatment, 22 dropped out immediately with no treatment information, leaving 167 subjects for analysis. Of these immediate dropouts, more were randomized to desipramine than to sertraline or placebo (14 [22%], 4 [6%], and 4 [7%], respectively; χ22=9.87; P=.007). Comparisons of the background variables and symptom measures between the immediate dropouts and the remaining sample (n=167) identified only 1 significant difference: the dropouts had lower premenstrual DSR scores during the screening period (Table 1). The mean±SD age of the sample was 34±6 years. At the pretreatment baseline, there were no significant differences between the treatment groups in the symptom measures (Table 1) or diagnostic variables (Table 2). Only 3 subjects reported previous use of antidepressant medication. Rates of discontinuation weres significantly higher in the desipramine group than in the sertraline or placebo group (30/64, 13/66, and 15/59, respectively; χ22=12.40; P=.002). Reasons for discontinuation after randomization to treatment were adverse events (n=26), medical violations of protocol (n=7), insufficient response (n=6), withdrew consent (n=6), and lost to follow-up (n=13). Only adverse events differed significantly among the treatment groups; they were more than twice as frequent in the desipramine group as in the sertraline or placebo group (χ22=7.65; P=.02). Adverse events were reported at each visit in response to general clinical questioning by a clinician and a global question on the subject self-report questionnaire (Table 3). None required medical intervention. Adverse events were reported during double-blind treatment by 35 patients (70%) in the desipramine group, 40 patients (65%) in the sertraline group, and 20 patients (36%) in the placebo group (χ22=14.42; P<.001). Nausea occurred significantly more often in the sertraline group than in the placebo group, and dry mouth, dizziness, and constipation occurred significantly more often in the desipramine group than in the placebo group. Improvement differed significantly between treatments (F2,163=12.47; P<.001, for repeated-measures ANCOVA, last observation carried forward). Improvement was significantly greater with sertraline treatment than with either placebo or desipramine treatment in pairwise comparisons (Table 4). Improvement with desipramine treatment did not significantly exceed that associated with placebo. The treatment results remained consistent without adjusting for baseline (F2,164=5.56; P=.005 for repeated-measures ANOVA, last observation carried forward), in the completer analysis (F2,120=7.13; P<.001, for treatment in repeated-measures ANCOVA), and in the nonparametric analysis of the ranked data at end point (Kruskal-Wallis test, P=.02). Improvement with sertraline treatment occurred swiftly in the first month of double-blind treatment and was maintained in subsequent months (Table 4). Analysis of the DSR factors showed that the sertraline group had the most improvement in all factors compared with the desipramine and placebo groups, with statistical significance for the mood (P<.001) and pain (P=.05) factors (Table 5). Analysis of the individual DSR symptoms showed that 5 of 7 symptoms in the mood factor were significantly more improved with sertraline treatment than with desipramine treatment or placebo (irritability, anxiety/tension, depression, feeling hopeless, and feeling out of control) (Table 5). Only mood swings favored desipramine over placebo, but this single occurrence among 17 symptoms may have been by chance. Patient Global Ratings of Functioning and Improvement supported the DSR results. At end point analyses, 37 patients (60%) in the sertraline group rated themselves much or very much improved vs 19 patients (38%) in the desipramine group and 16 patients (29%) in the placebo group (χ22=11.88; P=.003). The clinician-rated Ham-D17 showed a significant treatment response (F2159=7.44; P<.001, last observation carried forward). Sertraline treatment was significantly more effective than desipramine treatment or placebo; desipramine treatment did not significantly differ from placebo (Table 6). At end point, the mean scores for all Ham-D items were less than 1 in the sertraline group, with the exception of the psychological anxiety item (mean±SD, 1.11±0.99). The CGI-Severity ratings at end point were least severe for the sertraline group, with significant differences from the placebo and desipramine groups in pairwise comparisons. The desipramine group did not differ from the placebo group (F2,163=3.80; P=.02). The mean decreases in the CGI-Severity ratings at end point were 2.3, 1.5, and 1.5 for the sertraline, desipramine, and placebo groups, respectively (F2,163=4.08; P=.02). End point ratings of 1 to 3 (none to mild) were made for 38 patients (61%) in the sertraline group, 22 patients (44%) in the desipramine group, and 19 patients (35%) in the placebo group (χ22=8.68; P=.01). End point ratings of 1 or 2 (none or borderline) were made for 25 patients (40%) in the sertraline group, 11 patients (22%) in the desipramine group, and 12 patients (22%) in the placebo group (χ22=6.46; P=.04). To determine whether postmenstrual symptom levels or a history of depression (either of which might indicate an underlying depression) affected treatment response, each of these variables was added singly as a covariate and as an interaction with treatment in the treatment response model. Postmenstrual DSR scores were significant as a covariate (P<.001) but had no significant interaction with treatment (P=.59) and did not alter the treatment results, which remained highly significant (P<.001). History of depression was not significant as a covariate (P=.96), had no interaction with treatment (P=.48), and did not alter the treatment results, which remained highly significant (P<.001). None of the diagnostic or background variables altered the treatment results. The variables examined as covariates with treatment included diagnosis of PMDD (yes or no), premenstrual and postmenstrual depression scores at baseline as assessed by the core Ham-D17 and the Ham-D25, any SCID history (yes or no), percentage change in premenstrual DSR scores between the evaluation and placebo lead-in cycles, percentage change between baseline postmenstrual and premenstrual DSR scores, duration of PMS (years), cycle length (days), oral contraception (yes or no), age (years), number of children, and educational level (more than a high school education or high school education or less). End point DSR scores decreased by 50% or more from the pretreatment baseline in 40 patients (65%) in the sertraline group, 18 patients (36%) in the desipramine group, and 16 patients (29%) in the placebo group (χ2=16.82; P<.001). When both 50% or greater improvement from baseline and end-point DSR scores lower than the eligibility criterion score of 80 were considered, 34 patients (55%) in the sertraline group, 17 patients (34%) in the desipramine group, and 15 patients (27%) in the placebo group improved (χ22=10.18; P=.006). Symptom remission, as defined by premenstrual DSR scores reduced to the postmenstrual level (using the mean postmenstrual DSR scores during the screening cycles), was reported by 21 subjects (34%) in the sertraline group, 12 subjects (24%) in the desipramine group, and 8 subjects (15%) in the placebo group at end point (χ2=5.89; P=.05). Symptoms with the greatest change overall were irritability, anxiety/tension, feeling out of control, and depression. Disruption of functioning at a moderate to severe degree was required for study enrollment. The disruption on the dimension rated most severe by each subject at baseline was reduced at end point to none (0) or mild (1) by 33 patients (53%) in the sertraline group, 18 patients (36%) in the desipramine group, and 17 patients (31%) in the placebo group (χ22=6.67; P=.04). The overall treatment results in each dimension of functioning were as follows: family (F2,152=11.06; P<.001), work (F2,143=4.50; P=.01), and social activity (F2,152=5.18; P=.007) (repeated-measures ANCOVA, last observation carried forward). Sertraline treatment was significantly more effective than desipramine treatment and placebo in pairwise comparisons. The subject ratings in the QOLS had a differential treatment response (repeated-measures ANCOVA, last observation carried forward: F2,153=8.36; P<.001). Subjects receiving sertraline therapy reported significantly more improvement compared with placebo; improvement with desipramine therapy did not significantly exceed the placebo response. Sertraline therapy was more effective than desipramine therapy or placebo for total premenstrual symptoms and symptom clusters of mood and pain as assessed by the subjects' DSR ratings. Desipramine therapy was not more effective than placebo treatment. The results were consistent across all outcome measures, including DSR ratings, clinician and subject global ratings of treatment responses, the Ham-D, and subject ratings of functional impairment and quality of life. This is the first controlled comparison of an SSRI and a tricyclic antidepressant of sufficient size to confidently suggest the specificity of SSRIs in PMS/PMDD. Using a clinical definition of an improvement in symptoms of at least 50%, 40 patients (65%) in the sertraline group, 18 patients (36%) in the desipramine group, and 16 patients (29%) in the placebo group improved from baseline. A similar level of improvement was reported in a large multicenter PMDD trial, in which 62% of subjects who received sertraline therapy and 34% of subjects who received placebo improved.14 Although comparisons are limited by differences in design and measurement, other PMS treatment trials of serotonergic antidepressants (fluoxetine,5 paroxetine,17 and clomipramine18) likewise showed significant drug improvement, ranging from 52% to 69%, and placebo improvement ranging from 15% to 22%. Is the antidepressant response of patients with PMS caused by an underlying depressive disorder? Subjects with current major depressive disorder, dysthymia, or any other major Axis 1 diagnosis were excluded from the study. These data showed that a history of major depression obtained by SCID interview (35% of the sample) did not alter the treatment results. Furthermore, the baseline postmenstrual DSR scores, which ranged from absent to moderate, did not affect treatment outcome. Side effects contributed to but did not fully account for the poor response to desipramine. Only 27 patients (53%) completed treatment with desipramine, compared with 50 patients (80%) who completed treatment with sertraline and 41 patients (75%) who completed treatment with placebo. Dosage levels were examined to determine whether the higher doses resulted in discontinuation, but 14 of the 15 subjects given desipramine who dropped out did so because of side effects at the beginning dosage of 50 mg/d. (In the sertraline group, 3 of the 6 dropouts dropped out because of side effects at the beginning dosage.) We also examined the question of whether the limited desipramine response was caused by an insufficient dosage; 150 mg/d has proven to be effective for depression.32,33 This study, with a flexible dosing schedule, was not designed to draw conclusions about dosage, but several observations seem informative. Inspection of the DSR scores in the third treatment month showed that the small number of subjects who had a good response to desipramine therapy responded at the lower dosages of 50 and 100 mg/d and clearly improved, with DSR scores nearly identical to the DSR scores in the sertraline group at the same dosage levels. However, most of the subjects given desipramine did not respond well, and when the dosage was increased to 150 mg/d, they still did not show improvement (symptom scores at the 150-mg/d level were high and were nearly identical to those in the placebo group). We cannot say whether further increases of desipramine would have been helpful. The subjects in this report represent only a part of the heterogeneous PMS population. They sought medical treatment and had moderate to severe premenstrual distress characterized predominantly by irritability, anxiety, and dysphoric mood. The results are based on acute treatment for 3 menstrual cycles and do not address questions about long-term continuation of medication or relapse if the medication is discontinued, 2 important questions for further study. The sample did not include patients with comorbid physical or psychiatric disorders, which commonly have premenstrual exacerbations and constitute another important area for further study of PMS. Finally, it is important to consider that although 40 (65%) of the subjects treated with sertraline responded well, the other 22 (35%) did not. Moreover, only 22 subjects (35%) in the sertraline group experienced full remission of premenstrual symptoms. The reasons for this are not known, but the findings suggest that there are multiple subgroups of PMS with differing causes. The favorable response to the serotonergic antidepressant adds support to the evidence of serotonergic involvement in PMS, possibly through alterations in transmission34-37 or dysregulation in serotonin control of the hypothalamic-pituitary-adrenal axis.38 Recent preliminary studies showing efficacy of intermittent doses of SSRIs in the symptomatic premenstrual phase suggest a short onset of action and possibly avoidance of tolerance of the drug in PMS/PMDD treatment.15,16,19,39-41 The clinical utility of desipramine for PMS seems limited; only 18 patients (36%) in the desipramine group had a good response, and adverse events frequently resulted in discontinuation of treatment. This direct comparison of 2 classes of antidepressant medications strongly favored the serotonergic drug, which effectively reduced symptoms, improved functioning, and was well tolerated by women with severe PMS. 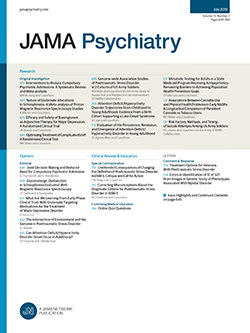 The data further suggest that the response of patients with PMS differs from that of patients with major depression; there was a significantly better response to the SSRI than to the more noradrenergic tricyclic antidepressant, and a history of depression and other variables associated with depression did not alter the treatment results. Accepted for publication June 18, 1999. This study was supported by grant HD18633 from the National Institute of Child Health and Human Development, Bethesda, Md (Dr Freeman). The setraline hydrochloride was provided by Pfizer Inc, New York, NY. We thank Beatriz Garcia-Espana, MA, for computer analysis; the study coordinator, Charlotte Furey, BSN; and the University of Pennsylvania Medical Center Premenstrual Syndrome Program staff. Corresponding author: Ellen W. Freeman, PhD, Department of Obstetrics/Gynecology, 2 Dulles-Mudd Suite, University of Pennsylvania Medical Center, 3400 Spruce St, Philadelphia, PA 19104 (e-mail: freemane@mail.med.upenn.edu).